I have a hard time imagining Thanksgiving without some great homemade rolls. I get that they can be intimidating and it’s just one more thing to make. I also get that you can buy store-bought rolls these days that are far from horrible. But the smell of yeasted rolls baking reminds me of the holidays almost more than the smell of turkey roasting. This is my favorite roll recipe this year and one that I’ll definitely be making for Thanksgiving. These Sweet Potato Parker House Rolls are great because they have some mashed sweet potato folded in which doesn’t really change the flavor all that much, but does make them really moist and gives them a great color. Also, I love these rolls because they open up and make for perfect little sandwiches for that next day turkey sandwich! These tender and fluffy homemade sweet potato rolls are perfect for Thanksgiving and for day-after sandwiches! 1) In a small bowl, stir together yeast and water and let it sit for 5 minutes. 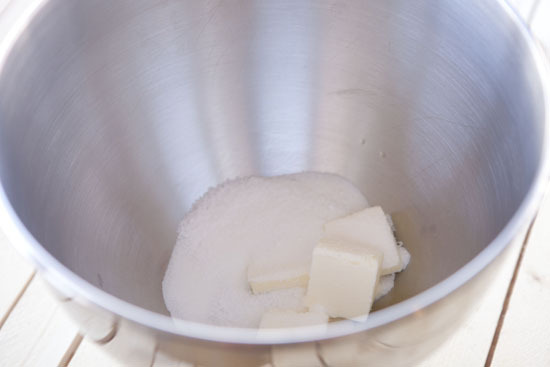 2) In a bowl for a stand mixer (or just a large bowl) add sugar and butter. 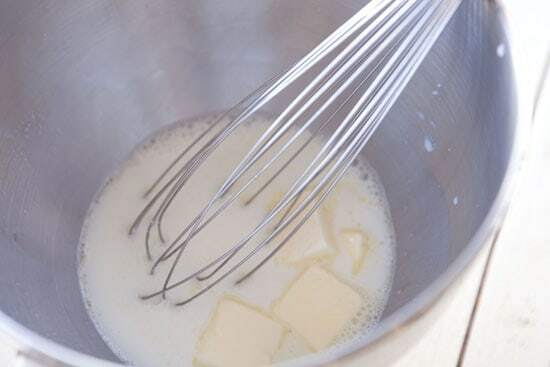 Pour warmed milk over the sugar and butter and stir until butter is mostly melted. It’s okay if it doesn’t all melt. 3) Microwave sweet potato, wrapped in paper towels and poked with a fork a few times, for 8 minutes on high. Let cool and then scoop out soft flesh. 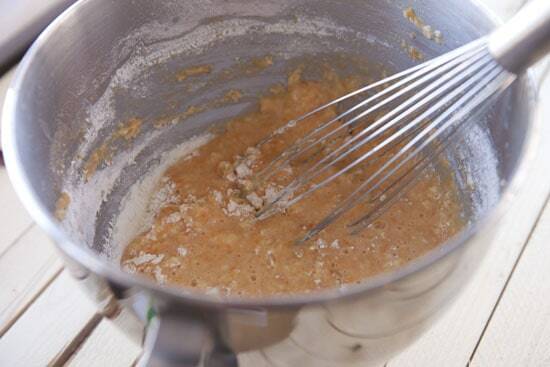 4) Add mashed sweet potato to mixing bowl along with yeast mixture. Mix together well. 5) Add salt and egg to the mixture and stir. 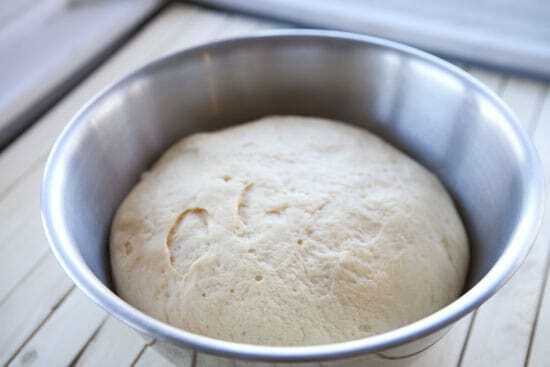 6) Add flour and mix until the dough is together. It should be soft, but not sticky. If it is sticking to the bowl a little bit, that’s okay, but if it’s very sticky then add more flour by the 1/4 cup until the dough is no longer sticky. 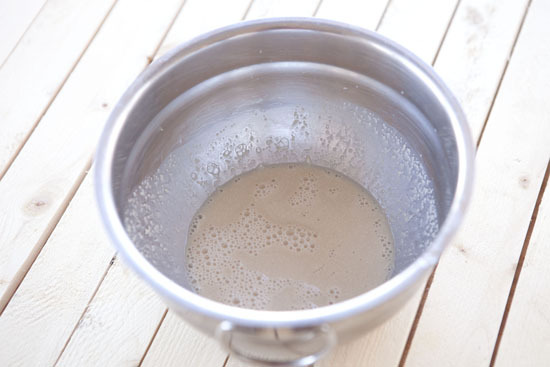 7) Once dough is mixed and the right consistency, add to an oiled bowl and let rise for two hours. 8) Punch dough down and cut it into thirds. Working with one third at a time, roll dough out on a floured surface into a 12×6 rectangle. 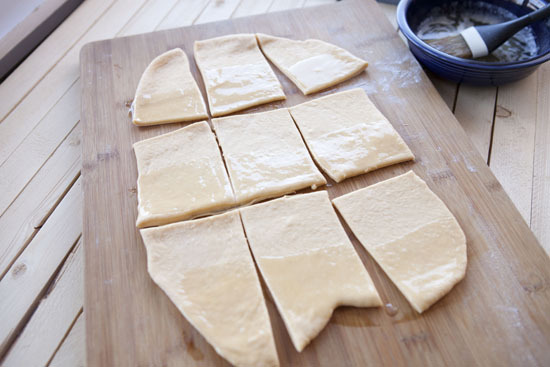 Cut the dough into 9 4×2 squares. 9) Brush half of each square with melted butter and fold over the other half so it slightly hangs over the edge. 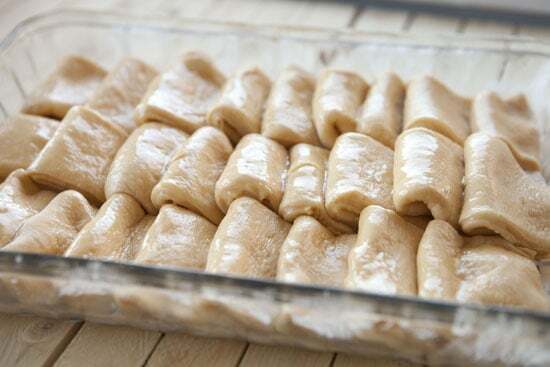 10) Stack rolls into a lightly buttered 9×13 baking dish. Repeat with all rolls. 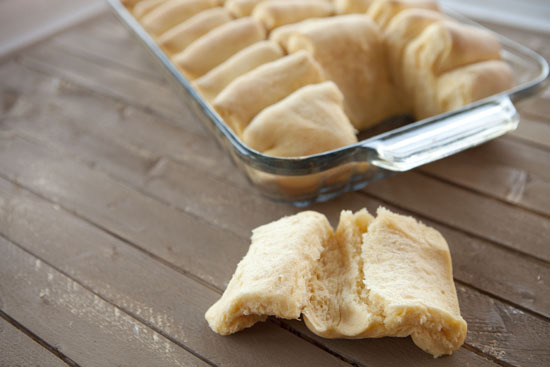 11) Brush top of rolls with melted butter and let rolls rise for thirty minutes. Preheat oven to 350 degrees Fahrenheit. 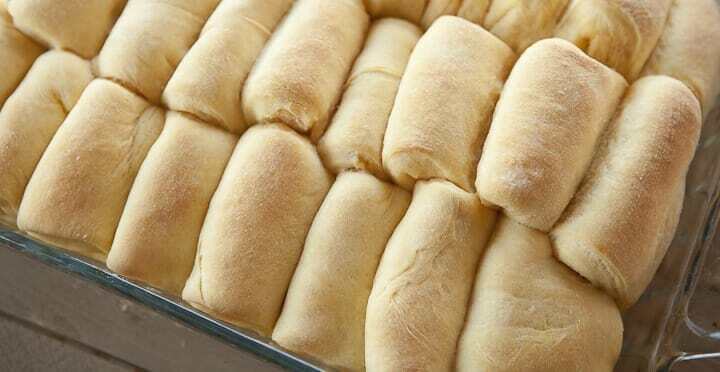 12) Bake rolls for 28-35 minutes until they are golden brown on top and cooked through. Let rolls cool slightly before serving. This is a pretty standard yeasted roll recipe. 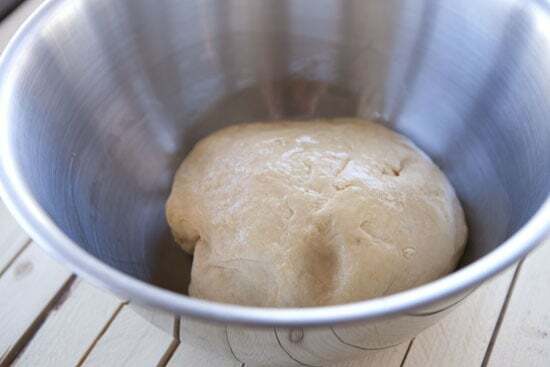 Start the dough by stirring together the warm water and dry yeast in a small bowl. This just ensures that the yeast dissolves entirely and that it’s active. It should start foaming slightly after a few minutes. If you have a stand mixer, you can use it, but you don’t need a stand mixer to make these. Either in the bowl of your mixer or in a large bowl, add the sugar and soft butter. Pour the warm milk over the sugar and butter and stir it together so the butter starts to melt and the sugar dissolves. The butter doesn’t have to melt entirely. Warm milk… not hot milk. 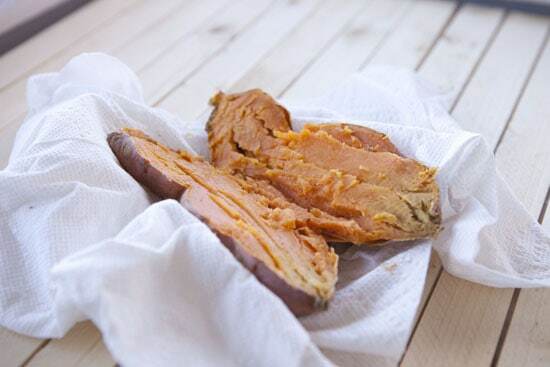 Because you just need the flesh for the sweet potato, just poke a few holes in a large one with a fork and then wrap it with a few paper towels. Microwave the sweet potato on high for about 8 minutes and then let it cool. Once it has cooled slightly, then and you can scoop out and mash the sweet potato flesh. Stir the sweet potato mash into the milk mixture and then add the yeast slurry. Before you add the yeast, make sure the mixture isn’t too hot or it will kill the yeast. It should be warm to the touch but not hot at all. Then mix in your egg and salt and finally start adding your flour. You will need at least 4-4.5 cups of all purpose flour to finish the dough, but you might need even more depending on how much moisture is in your sweet potato. I recommend starting with 4 cups and then add more flour by the 1/4 cup. If the dough is being really sticky, then you need to add more flour. This, for example, is too sticky. I had to add about five cups of flour before my dough was the right consistency. 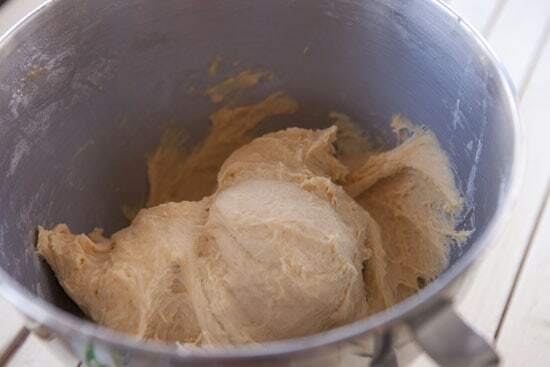 At that point, either mix the dough with the dough hook on medium speed for about five minutes or knead it lightly for 6-8 minutes until the dough is really soft. Add the dough to a lightly oiled bowl and let it rise for two hours. After two hours it should more than double in size. This is a kind of interesting roll technique that results in rolls that you can easily pull apart. They are a bit of work, but the end result is great. Just punch down your dough and then cut it into thirds. Working with one third at a time, roll it into a large rectangle, about 12×6. Then cut that rectangle into 9 smaller rectangles, each about 4×2. Brush half of each rectangle with melted butter. This is a third of the dough. Folded and in the pan. Repeat until all your rolls are done and then brush them with some melted butter and let them rise in the pan for 30 minutes. Bake these guys at 350 degrees Fahrenheit for about 28-35 minutes until they are golden brown on top. After these cool you can peel them apart which is really fun. Like I said, perfect for sandwiches! If there’s ever a day to bust out the mixing bowls and make some great rolls, it’s Thanksgiving. I will be making these Sweet Potato Parker House Rolls and I suggest you do the same! Hey Lauren, before you cut them into 9 you divide the dough into three even parts. Then you work with each of those thirds and roll it out and cut into 9 pieces which makes for 27 finished rolls. Hey Nick — These look awesome. Squishy and yummy! I suppose I could divide them and roll them into more traditional balls with the same yummy outcome, yes?? Thanks for sharing, I love the folding technique. These look totally worth the trouble. Happy Thanksgiving. Well, I’m responsible for the sweet potato casserole this year, so… yeah, I’m going to be making this, too! What a great spin on bread rolls!! Love this idea. Thank you for sharing it. 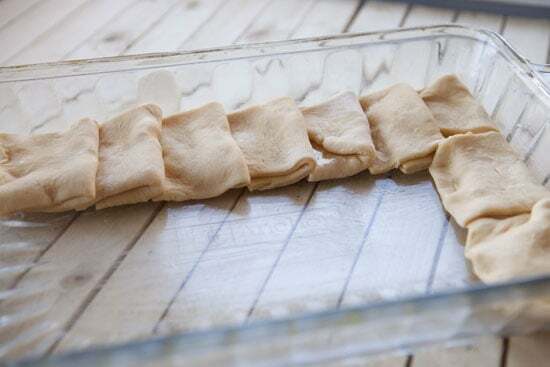 Those look great – when you fold them, do you just fold them in half? I folded them so the top half (unbuttered) overhangs just barely. That way when they shingle the rolls they kind of sit on each other. Check out the third photo from the bottom which kind of shows it. I made them for Thanksgiving – and they were a total hit! I loved it when my mom would make parker house rolls, although she never used sweet potato. I can imagine these tasted great. Nick- can I make the dough and let it rise and then divide it in half tonight- then let them rise for the last half hour tomorrow and then bake them? I don’t know if I can do 4 hours tonight alone! Thank you! I meant divide it in thirds and then bake them tomorrow. Whoops. Yea… I think that would work. What you don’t want to do is shape the rolls and not bake them for 12 hours. They will just get huge and have too much air in them. You should be able to make the dough in advance and divide it however you want and then form and bake the rolls the day of..
Yayyy! Just made ’em and they are beautiful! Thank you very much, and Happy Thanksgiving to you! These are the first yeast rolls I have ever made and they were super fun to make and taste divine. My very picky 2 year old loves then. Winner! Thanks for the awesome recipe! Cant wait to eat leftovers tomorrow. Happy thanksgiving. Made these and they were a big hit! The were almost a FAIL as I thought I had a sweet potato on hand but then did not…. so i used a *gasp* can of pumpkin. Which made the best rolls ever had at my family’s Thanksgiving and I’m requested to make them again! They were a lot more orange but the flavor was very subtle. Made great sandwiches with the leftover turkey the next day. Awesome substitution Jen! Love it. Nick, I made these for Thanksgiving, and they were a huge hit! A quarter of the pan was gone before we even started eating lunch. They were addicting. Everyone was shocked that they had sweet potatoes in them. The flavor was very mild, but it made the rolls so soft. Everyone was asking me for the recipe. I cut mine a little smaller, because my grandmother was worried we wouldn’t have enough. My pan was empty anyway by the time lunch was over. Next year I will have to make two pans. I was wondering though what you thought about gluten free flour. I am now gluten free and I’m new to baking with gluten free flour. I wonder if they would do just as well. Thoughts? Glad they turned out great! To be honest, I’m not very familiar with gluten free flour. I’ve only used it once that I can recall. I think it would work, but the rolls would probably lose some softness. If you give it a shot, let me know how they turn out! These have been a Thanksgiving staple at our house for years. My wife just put them in the pan for their secondary rise. I love these rolls.